Ryan and I just got back from a whirlwind trip to Chicago! We were there for exactly 24 hours. Red-eye flight on Friday, followed by sister-hangout-time, followed by an awesome wedding, then trip back to the airport to catch our 5:00 AM flight back home on Sunday. Phew. We. Are. Tired. But we had so much fun! Got to have some sister hangout time! It was so good to see her sweet face. And then got to see these crazy kids! It was so great to spend some BFF time with this girl. Wish we lived closer! We also got to play some bocce ball! The reception was at Pinstripes, a really neat venue that had outdoor bocce ball courts and everything! The wedding was perfect. The ceremony was beautiful, the reception was so much fun, and seeing your friends get hitched and so happy is priceless. I just love weddings. I can't believe I forgot to get a picture of the bride and groom! What was I thinking?! It was quite the trip! And it was so worth it. A while back, I posted about our new little aquavit bar I made in our dining room. Ryan and I will skål with some aquavit on special occasions [like getting a new job, celebrating an anniversary, or even just having a clean apartment! ], and it's become a fun tradition. Unfortunately, aquavit hasn't become a mainstream liquor here in the States [yet]. So after some stealthy google searches, I've decided to give making my own aquavit a whirl, and you probably should too. Put your fresh dill and citrus zest into a clean, glass bottle with a lid. Using a funnel, pour your bottle of vodka into the glass bottle containing the citrus and dill. Remove the dill and citrus from the vodka after it has completed infusing. I did this by pouring out the contents of the bottle into another glass bottle, using a funnel and cheesecloth to catch the zest/dill. Add caraway seeds, fennel, and star anise. Let infuse for 2-6 days, depending on the strength of flavor you are looking for. I really enjoy the anise/caraway flavor so I let it infuse for 5 days and it gave it a very pronounced anise flavor (like black licorice). Once your flavor level has been reached, discard spices. Ta da! You've just made your very own Aquavit! Toast to something special! Verdict: Ryan and I both loved it! It definitely had a stronger anise flavor than the Skåne brand aquavit we bought in Sweden. We really liked the nuanced flavors, including the citrus. For future batches, I may even let the citrus infuse one day longer. Please email me with your mailing addresses so the prizes can be shipped. Righteous Bros. Cold Brew GIVEAWAY! 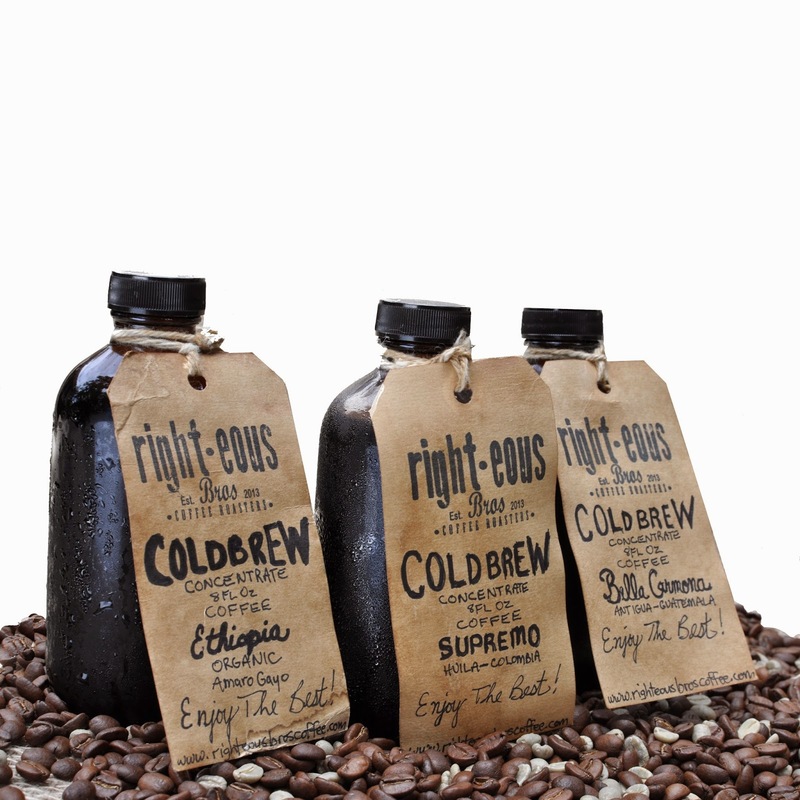 Thanks for joining us today, after the cold brew coffee tutorial, for this great opportunity for you to win your very own cold brew by Righteous Bros. Coffee Roasters! Righteous Bros. Coffee Roasters are based in Houston, Texas. They roast their own beans and make one mean batch of cold brew coffee. Lucky for you all, today you have a chance to win 2 free bottles of their amazing cold brew coffee concentrate! -The winner will be announced Saturday, August 16 at 7:00 AM. -Be sure to link back to your blog/email so I can contact you if you win! *I have not been paid to promote Righteous Bros. Coffee Roasters. All opinions are my own. You guys! The day is here - the first of two amazingly-awesome-coffee-themed giveaways! Thanks for joining in yesterday for the cold brew tutorial, and welcome back for the first giveaway! Today you have the lucky chance of winning your very own CoffeeSock! I've been using mine since I got it and love it! CoffeeSock is a family owned and operated business, based in Austin, Texas. They make reusable filters out of organically grown, untreated cotton in all sorts of sizes for various machine types. Be sure to check out their website for more details, pictures, and reviews! If you'd like a chance to win a free, reusable CoffeeSock of your choice, all you have to do is leave a comment below about your favorite type of coffee! And be sure to check back on Wednesday for your chance to win 2 free bottles of cold brew concentrate! -Be sure to include or link back to your blog/email so I can contact you if you win! *I have not been paid to promote CoffeeSock. All opinions are my own. Easy Cold Brew Cardamom Coffee + 2 GIVEAWAYS! You guys are in for a treat. I have 2 very special giveaway items this week! And both of them are coffee-related. What could be better than that!? CoffeeSock and Righteous Bros. Coffee both are generously giving away items just for you guys! Check back tomorrow for your chance to win a CoffeSock, and Wednesday to win 2 bottles of some Righteous Bros. cold brew! So, are you on the cold brew coffee wagon yet? If you're not, hop on, because this stuff is delicious and couldn't be easier to make! Not to mention, it's way more fun to drink an ice cold coffee drink in the dead of summer than a steamy hot cup of coffee, especially when you're waking up sweating from the summer heat. If you're not familiar with cold brew coffee, here's the deal: It is less acidic than its hot brewed counterpart, and even tastes less bitter than your traditional cup of hot joe. Why, you ask? Well, because the coffee bean isn't actually being "cooked," it doesn't release as much acid, which can result in a bitter-tasting brew. By cold brewing, you're essentially just letting the water take on the flavor of the beans. When left to steep for 12-24 hours, what's left is concentrated, delicious coffee! I use approximately 4-5 tablespoons of coffee per 1 cup of water. If you don't like cardamom, just leave it out [or use cinnamon!]. For my french press, I add 1.5 tablespoons of cardamom, approx 3/4 cup medium ground coffee [good quality], and 3.5 cups of water. Pour the water over the grounds and cardamom. Ah. Just look at the frothy, coffee goodness! Let steep for 12 - 24 hours. I usually make a batch in the evening and let it just sit out overnight, with the lid on, of course. After your brew has steeped for a solid 12 hours (at least), slowly begin to push your plunger down until it reaches the bottom. If you press too quickly, some of the grounds will sneakily escape into your brew. If you don't have a French press, just pour your mixture through a coffee filter (or better yet, CoffeeSock!). Once filtered, pour your cold brew into a bottle/jar and keep in the refrigerator for up to 4-7 days. When you're ready for a nice coffee drink, put a few ice cubes in a glass and add some of your cold brew with a splash of milk and homemade cinnamon syrup, if you so choose. And huge thanks to Ryan, for volunteering as the official taste tester for my many food adventures. He's a keeper. Lately, I've been all about cold beverages. It's probably because of the LA heat, but besides my morning cup of hot joe, I can't bring myself to drink hot coffee in the afternoon anymore. What's happening to me?! Fear not. I found a way to work in my daily coffee intake by whipping up some fun iced coffee beverages. Infused simple syrups! This cinnamon one has been my recent fave (I'll have to share the cardamom one later! ), and it's positively delightful in a cup of cold brew iced coffee with milk. You can increase amounts to make more, just use equal parts sugar and water and up the spice. Bring the water to a boil in a small saucepan. Once it reaches a boil, add the cinnamon sticks and let steep for about 5 or 10 minutes. The water should look a bit brown like the cinnamon has infused. Remove the cinnamon sticks from the water and add the sugar. Stir until all the sugar is dissolved. Enjoy in iced coffees, hot coffees, hot chocolate, or even a fancy schmancy cocktail! It will keep well in the refrigerator for at least 2 weeks. I have been loving this stuff with cold brew coffee...so good! It's delicious all year round - but espeically during the holidays when things start cooling down (my favorite time of year!). This will warm up any drink! One day, I may even create a Shutterfly recipe book to keep track of all the creations I've tried. Stay tuned! I'll be sharing a fun cold brew coffee tutorial next week, which includes 2 awesome giveaways! Don't miss out - August 11! So maybe it's because Ryan and I have been watching too much Mad Men recently, but I had the sudden urge to make a little bar in our dining room. I knew it couldn't be just any bar, though. It would have to be an Aquavit bar. If you too would like your very own aquavit bar but don't know where to purchase it - look no further! Bev Mo sells it apparently. Who knew?! I'm also in the process of attempting to make my own! Not distilling my own, but essentially just infusing vodka to get a similar taste. I'll be sure to post about how it compares to the real deal when it's finished. As you probably already know, Ryan and I moved into a new apartment back in February. Which means we've almost been there for 6 months already! I cannot quite wrap my head around this because there are still so many projects and things to do [including organizing the entire closet in our guest room, among other things]. One of the things we have yet to do is hang up art. Sure, we have a couple token things here and there, but most of our walls are pretty bare. I don't think I ever really realized how tricky it is deciding on wall art. I mean, you're going to see it everyday. It just seems like such a big commitment. And for the past 6 months, I hadn't come across anything that I really wanted to look at everyday. Until we went to Sweden, that is! I found these adorable Scandinavian printed tea towels while we were in Gamla Stan, Stockholm. At the time, I didn't expect to frame and hang them, but after getting home and trying to decide what to do with them I thought hanging them up was the perfect idea for our little dining room! They really brighten up the dining room, and I love the reminder of Sweden when I look at them! Do you have a cute tea towel laying around? Make some wall art! To begin, iron the crap out of that tea towel. They love to wrinkle. I ended up buying starch (which I had never once used before in my life) to make sure all those pesky wrinkles came out. I tried it first without the starch, but once they were framed I kept noticing all the wrinkles that didn't come out and it drove me nuts. Trust me, you don't want to skip the starch! Flip your frame over and follow the manufactures' directions for disassembling and reassembling. Lay your tea towel, facing outward, on the glass. Smooth out and make sure it's laying evenly and centered. Place the white paper over the tea towel and refasten the back of the frame securely. If you have a loose frame, you may want to tack the upper corners of your towel in place. The frames I used were extremely tight so I didn't have an issue with it. Decide where to hang your new wall art! The final leg of our trip was checking out Oslo and heading on the Norway in a Nutshell tour from Oslo to Bergen. While in Oslo, we took a boat over to Bygdøy peninsula and saw the Viking Ship Museum and the Nordic Folk Museum. Both were great! We also walked around Akershus Fortress which was pretty cool. On our journey to Bergen we got to see some of the most beautiful landscapes I've ever seen! We saw waterfall after waterfall and the fjords were breathtaking. Not to mention we had the perfect weather - bountiful sunshine. After a full day of traveling and drinking in the beautiful Norwegian fjords, we arrived in Bergen. I highly recommend seeing the fjords of Norway someday if you haven't already. The wharf in Bergen was pretty spectacular as well. And here we all are in Bergen, Norway! All in all, we had a fantastic trip and saw tons of Scandinavia! Now all I need to do is print out a few photos so I can frame a couple and constantly think about vacation! I love being on vacation.